The bilingual exhibit, Clever Together: Our Everyday Choices/Juntos somos ingeniosos: Una decisión a la vez, is OMSI’s latest permanent installment. Clever Together is on display in OMSI’s newly transformed Earth Science Hall for the next roughly eight years. The exhibit encourages visitors to make more sustainable decisions by weighing the impact of their choices in three ways: environmentally, economically and socially. The Clever Together experience is based on the idea that being sustainable requires being aware, and that the smallest action can make the biggest impact when made by the hundreds, thousands, or even the hundreds of thousands. The exhibition is accompanied by OMSI’s new Local Voices, Clever Choices/ Nuestras voces, nuestras decisiones community outreach campaign, also bilingual, which incorporates a variety of digital and traditional communication mediums. Community members are invited to go online (to www.omsi.edu/choices or www.omsi.edu/decisiones) to see local stories about sustainability, share their own stories, and participate in challenge-based games where they can earn badges representing the top 10 actions individuals can make to support their local economy, environment, and community. 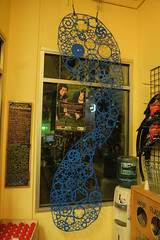 We have been very pleased to work with OMSI to create an exciting display, which is currently featured in our bike shop on NE Alberta Street. The display includes the stories of Deysi and Ivonne, a mother daughter duo who participated in Bike Club and Andando en Bicicletas en Cully, a bike committee in the Cully neighborhood. You can listen to their stories in our bike shop, by simply scanning the QR code featured on the sculpture, or listen to it online. Signs, social media, creative artwork, newsletters, and other outlets throughout the community display links and the phone number for other stories (503.797.4686), as does the permanent exhibition within the museum. 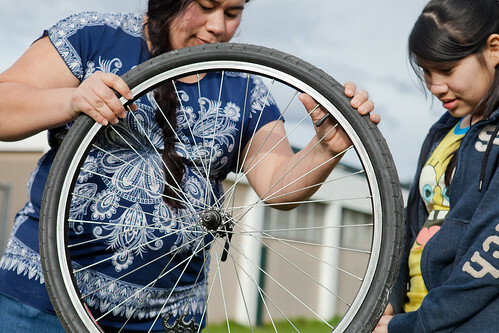 By learning about bicycle maintenance and safety education through the Community Cycling Center’s programs, Deysi and her daughter Ivonne discovered their personal potential. Deysi received hands-on bike maintenance training while a member of Andando en Bicicletas en Cully. 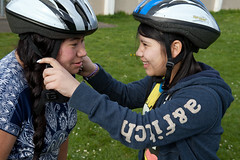 Ivonne gained confidence through our Bike Club program. Special thanks to OMSI for sharing their stories, while inspiring others in our community to make sustainable choices in their lives.